The Biblical World: Earliest Copy of Mark Found? The blogosphere is buzzing (here, here, here, and here) about the possible discovery of the oldest copy of the Gospel of Mark. Apparently the discovery was announced by Dan Wallace as part of a debate with Bart Ehrman. Here is what Dan said. We have as many as eighteen second-century manuscripts (six of which were recently discovered and not yet catalogued) and a first-century manuscript of Mark’s Gospel! 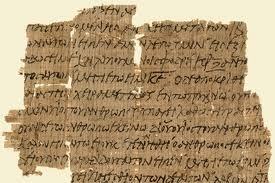 Altogether, more than 43% of the 8000 or so verses in the NT are found in these papyri. Bart had explicitly said that our earliest copy of Mark was from c. 200 CE, but this is now incorrect. It’s from the first century. I mentioned these new manuscript finds and told the audience that a book will be published by E. J. Brill in about a year that gives all the data. (In the Q & A, Bart questioned the validity of the first-century Mark fragment. I noted that a world-class paleographer, a man who had no religious affiliation and thus was not biased toward an early date, was my source. Daniel Wallace adds in the comments section:Friends, let me clarify a couple of things. First, the Mark manuscript is just a small fragment. Second, I didn’t discover it; I make no claims whatsoever for having done so. Third, exact news of the fragment will have to await its publication about a year from now. The origin of this latest fragment is not yet known. And it will be a least a year until we learn anything more about it. The possibility that we now have a first century copy of Mark is quite exciting, but I think it is wise to handle this with caution. As we have seen many, many times before, artifacts and manuscripts that surface with fantastic claims tend to be much less than they are claimed to be. I am confident that Dan Wallace would not mention this fragment unless he truly thought it was of significance. Once it has been published and can be properly studied by a number of scholars we should know more about what this fragment can teach us. Although it ratchets up potential sales of a publication to make large claims and posit sensational inferences about items, it doesn't help the sober scholarly work involved. It also doesn't actually accrue any credit or greater credibility for the items or those involved in handling them. It will be interesting to see how this develops. Until then . . . I believe this is part of the Green collection. I don't think these fragments have been officially dated, even if they prove to be very early. The Romans fragment, for example, was initially said to be mid-second century, but I think this was somewhat of a "first glance" date. Basically, I think we're going to have to wait for a bit, like everyone else is saying. Besides paleography, are more direct methods of dating the physical papyri (for example, scanning or lasers) going to become possible? Or are the sources just to fragile? Having not seen the actual fragment it is hard to say. If for instance, carbon dating is possible for papyrus, the fragment may be too small to take a sample since it would diminish the artifact. Has there ever been a follow up to this? Was the date confirmed? Here's a follow up, quoting me in this post.